Sometimes we have cravings. For me, that craving is often Chinese food, and not just any Chinese food, but the old-school greasy appetizers that barely qualified as any sort of nutritious meal, but were so delicious and addicting. One of those favorites of mine was egg rolls: deep-fried flour-wrapped ground pork, cabbage, carrots, and green onions. I’m not sure what else was in these exotic delicacies of my youth, but as I grew older and my taste buds matured, I learned how to make a variety of versions of various rolls. All were delicious, and all were very time-consuming. In a small bowl, mix soy sauce, white part of chopped green onions, ginger, and garlic. Set aside. Brown ground pork, then add a third to half of the sauce mixture**. Add cabbage, carrots, and the rest of the sauce mixture. Cover and cook on low until cabbage is softened. Serve in a bowl, as is or over rice. Top with green part of chopped onions and a drizzle of toasted sesame seed oil. **shortcut alert: Prep all veggies and sauce in advance. Cook pork and refrigerate up to a day in advance. When it’s time for dinner, heat up pork and add veggies and sauce. Pork mixture can also be made ahead and frozen for a future meal – just add veggies and sauce! Cooking healthy meals, while important, is not all there is to healthy eating. Snacking is a part of life and we just need to accept that. For some people who eat many small meals each day, it’s a very big part of life. So how do you keep from reaching for a candy bar or bag of chips when you get the munchies? Well, for starters, don’t buy those things (duh!). Ok, so even if you don’t keep junk in the house, you still need healthy snacks to be just as easy to grab when the moment strikes. When you organize your refrigerator and pantry to make snacks easy and appealing, the battle is half won. You will also want to keep a variety of sweet and savory snacks. You may crave either one at any given time so be prepared. Consider your cravings. If you’re craving chocolate, it’s likely your body needs magnesium. Grab a handful of raw almonds instead. Craving salt? Salt isn’t a bad guy. Your body needs salt to help control the balance of water and other fluids in the body. You could be dehydrated, try drinking some water. It could be the actual sodium your body wants, so try celery with natural, salted almond butter instead of a bag of chips. Sometimes it’s oily foods masking as a salt craving. Halve an avocado and mash with a little salt and pepper for a super healthy and filling snack. Add a dash of Sriracha for a super flavorful kick! One of my favorite snacks is cheese chips. I’m not talking about the fish shaped cheese crackers or any other commercially prepared snacks. This is just cheese, baked to crispy goodness. You can use most any cheese you like. My favorite is a 3 or 4 cheese blend often used in Mexican cooking. Method: Line a cookie sheet with parchment paper (or use Silpat silicone baking mats). Place small “haystacks” of shredded cheese on paper or Silpat as if you were baking cookies. You can fit 9-20 per cookie sheet depending on size (9-12 on a quarter sheet pan that fits in a toaster oven or up to 24 on a half sheet that fits in a regular oven). Be sure to leave space for the cheese to melt and spread a bit. Bake in preheated oven at 400 F for 10-12 minutes. Let cool, chips will crisp once cool. While I don’t have a microwave, I’ve heard that this can be microwaved as well. You can also use sliced cheese, cutting each square cheese slice into 4 smaller squares. Try different cheeses for a variety of flavors. Pepper jack is another great flavor especially dipped in guacamole! Honor your cravings and keep healthy snacks on hand for whenever the urge to much strikes. Being prepared will help you stay on track with healthy eating habits. Something that comes up a lot is packing a lunch for work. Even the best local dives, while relatively inexpensive, still add up. Consider that a quick takeout salad or sandwich lunch downtown runs about $10. Five days a week and 4 weeks per month takes your lunch expense to $200 each month! I don’t know about you, but I can certainly think of a few other things I could do with $200. Of course, brown bag lunches often bring visions of peanut butter and jelly sandwiches, cold leftovers in Tupperware, or the ubiquitous cup of noodles. It doesn’t have to be that way though. Consider first what you like to eat and how that might be prepared in a to-go situation. There are a variety of thermos type containers to consider, as well as thermal lunch bags that keep your hots hot and your colds cold. One of my favorites is the Bento thermos . It’s a large-ish thermos with 3 smaller containers inside and it comes in a thermal tote bag. There’s a larger version as well for those who have a bigger appetite than I do. And a bonus, my thin coffee thermos fits in the same tote bag! I like the three containers for breakfast, lunch, and snack. I leave super early in the morning so don’t eat breakfast until I get to work. Instead of opting for the nearest mc-breakfast sandwich, I scramble eggs, chopped bacon, and cheese before I leave and pop it in the smallest bento container. Lunch is often leftovers from dinner the night before, heated before I leave home and put in the largest container. The medium container gets a snack or another lunch item. Breakfast is still hot when I get to work (after an hour and a half train ride), and lunch is still warm at noon. Ok, so you’re still thinking “leftovers”, ugh! Just hold on a minute. Let’s take a look at some of the recent recipes we’ve created. Chicken enchilada bake with a little extra salsa makes a perfectly nice lunch, or you can take some of that leftover chicken and wrap it in a tortilla or lettuce leaf for a taco/wrap. How about that shredded pork? Put some in one container and some lettuce and tomatoes in another container. With a dollop of salsa you’ve got a taco salad for lunch. Quick and easy! So what if you don’t have any leftovers, or really don’t want leftovers 5 days a week? Then make up some other lunch options when you’re doing your weekly meal prep on the weekend. Planning on chicken stir fry one night for dinner? Cook a couple of extra chicken breast tenders at the same time and make chicken salad. Dress it up by using wasabi mayonnaise or mashed avocado. My favorite is adding turmeric and black pepper. You can even make a couple of small batch variations for variety during the week. Toss some in a lettuce leaf for a healthy wrap or serve some with tortilla chips for a fun variation. Options: wasabi mayo and chopped green onions, turmeric and black pepper, celery and onions, or cranberries and walnut pieces. Just use your imagination! I’ve touched on prepping ingredients for meals a bit in the past, but what does this really mean? It could be just chopping vegetables ahead of time for quick assembly when it’s time to cook. Or it could mean assembling the entire meal so it just needs to be popped in the oven when you get home from work. Depending on your available time and the type of meal, you can even go so far as creating the entire meal and freezing it. When it’s time for dinner, all you need to do is heat and eat. Since we’re getting back to basics and finding time to create whole food healthy meals instead of pre-made store bought meals or ordering takeout, let’s focus on saving time by prepping as much as possible for a week’s worth of dinners. Planning your menu will help you plan your grocery trip. Cooking meals with similar ingredients is a start. The frozen chicken tenders gave us an Enchilada Bake and an Asian inspired stir fry by just switching up the add-ons. We can do the same with a pork roast. A 3-4 pound pork roast can give you a couple of chops and some shredded pork for tacos or BBQ sandwiches. Back to your basic shopping list. For the previous recipes we’ve focused on some frozen chicken breast tenders. Let’s add some variety to the list and get a pork loin roast. Let’s say you want chicken stir fry on Monday, shredded pork tacos on Tuesday, chicken enchilada bake on Wednesday, and Pork chops on Thursday. You’ve shopped for your meats and veggies this week and you already have your pantry staples from previous shopping trips. Now just set aside an hour on the weekend to prep for the week. I cook for two people and try to allow for leftovers to bring to work for lunch. If you are feeding a family of 4 or more, just adjust the amounts. Take your pork roast and cut two 1/2-3/4 inch chops off the end. Put these in a zip lock Baggie and toss in the freezer for Thursday. The rest of the pork roast goes into either a crock pot or electric pressure cooker. Add a splash of water, broth, or a couple of tablespoons of salsa for moisture while the pork cooks down. I highly recommend getting an electric pressure cooker, like the Instant Pot. Like a crock pot, you can turn it on and walk away, but the IP will only take about 1/4 of the time of a crock pot to cook that pork roast. You can even cook from frozen! The 3 pounds of pork roast left after the chops will cook down in about an hour in the pressure cooker. While the pork is cooking, cut your chicken tenders into cubes and store in a sealed container or zip lock baggie in the fridge for Monday’s stir fry. If these are too frozen to cut, just toss them in the bAggies and they’ll be thawed for Monday’s dinner and you can cut them up then. Chop your stir fry veggies and store as well. Next place your frozen chicken tenders for the enchilada bake in your baking dish, top with salsa, and store in the fridge until Wed. Pyrex baking dishes (like these) with plastic lids are great for pre-prepping meals as they go straight from the fridge to the oven. If you’re leery of storing meat in the fridge in advance, you can keep it the freezer, but remember to put it in the fridge the morning you will need it so it will be thawed for dinner. You now have three meals prepped! Once the pork roast cooks down, shred it using two forks. Store the pork in a covered container in the fridge for tacos on Tuesday. Depending on how many people you are feeding, you might split it into two portions and freeze one for another time. Shredded pork is not only great for tacos, but also on nachos or with BBQ sauce for a BBQ sandwich. So here you go. With minimal ingredients and a little time on the weekend, you now have four home cooked meals prepped and ready for your busy week ahead! So here’s the deal, you don’t have time to cook full meals because you work, and have kids, and have to go to the gym, and you don’t have the right ingredients in the pantry, and…I get it! Step 1 for healthy, home-cooked meals is having the food available to cook. If you only have frozen pizza, canned soup, and condiments then there’s not much available to cook even if you found the time. Cooking full meals requires planning (until you become so good at it you could MacGyver that pizza and soup into a 4 course gourmet meal). Even then, there will still be some planning involved and this starts with filling the fridge and pantry with versatile ingredients. Remember that bag of frozen chicken tenders we discussed previously? Not only could that be used for the Chicken Enchilada Bake, but also: Asian stir fry, shredded BBQ chicken, Greek chicken kabobs, chicken in mushroom sauce, and tons of other quick and easy recipes. Then there are the add-ons like cheese, salsa, herbs and spices. Keep your favorites handy. Shredded 3 cheese blend is great for Mexican dishes, omelettes, and even on top of burgers. Choose a couple of sauces and salsas you like. Yes, you could make these from scratch too, but let’s start simple. For now, buy the sauces and condiments. There is an array of sauces available depending on your mood: BBQ, Asian peanut, green and red salsas, curries. Keep a couple of options in your pantry. Next are the veggies. Again, we’re keeping this simple for now. Pick one or two you like that can last a while. I almost always have broccoli and avocados. I get carrots and celery as needed (you know, for stir frys or chicken salad). Seasonally others may show up in my cart like spring asparagus or winter squash for variety. Onions also go in just about anything. A few other staples to keep on hand are good quality butter, coconut oil, eggs, rice, pasta, pasta sauce, and good quality salt and pepper. If you can find these in the grinder jars, even better! By keeping versatile staples available, meal prep will be so much easier and you can even prep a meal on the fly when the mood strikes. To get the most out of your shopping trip and to keep it as short and painless as possible (you are very busy after all), make a list. If possible, put the list in order of your grocery store layout. This will keep you from backtracking and ending up with a cart full of items you probably don’t need. My local store has produce just inside the door, then fresh meats, frozen, pantry, then dairy. I can usually fill a cart from my list in 10 minutes and I’m outta there! Lets say you now have all of the ingredients listed above. What can you do? The last post gave you a Chicken Enchilada Bake (chicken, salsa, cheese). This time, let’s go for an Asian Stir Fry (chicken, broccoli, rice). We are keeping this simple, and there’s no need for a wok, so I guess technically it would be a chicken vegetable sauté. Whatever. Do yourself a favor and buy a rice cooker. Rice can be cooked on the stove, but you don’t have time for that, remember? Follow the directions on the bag of rice and your cooker for amounts, typically 1part rice to 2 parts water. A full pot of rice will take less than 45 minutes and will stay warm until you need it. Put the rice on and go do some chores, a quick workout, or relax with a cold beverage. A rice cooker will automatically switch to warming mode when rice is cooked and stay warm until you are ready. Since the stir fry will only take a few minutes, you now have some time to chill. Once the rice is cooked, add a table spoon of coconut oil,to a heated frying pan. Toss in chicken cubes and cook until done (the small cubes will only take a few minutes). Drizzle soy sauce to taste (go light at first, a little goes a long way and you can always add more). Turn heat up, add a splash of water and broccoli. Cover and let steam about 5 minutes. Serve over or next to rice. This is a very simple version to get you started. You can embellish with additional veggies like carrots, onions, and celery. Toasted sesame oil sprinkled on top after cooking gives a fantastic depth of flavor. To have this meal during the busy work week, you can cut up the chicken and vegetables beforehand and store in the fridge. They will then be ready to toss in a pan and ready in 10 minutes. You can just do vegetables for a vegetarian meal. You can make a larger portion of meat and veggies and omit the rice for low carb. Once you get the hang of a basic one-pan meal like this, the sky is the limit on which ingredients you use! Yes, this project fell by the wayside. There are so many activities to keep up with: weaving, spinning, hiking, kayaking, and even work. This is what got me thinking again. People are busy. I am busy. You are busy. Because of this, many young people never learn to cook with whole food ingredients. Many older people just stopped cooking at all and rely on heat-and-eat meals from the grocery or eating out. Don’t get me wrong, I love a good restaurant meal, especially if it’s at a locally owned and operated, non-chain establishment. But as busy as we are, real food at home is a necessity. And learning how to cook real food is a crucial life skill. As busy as we are, it can be done, it just takes a little planning, both at the grocery store and in the kitchen. When I first started writing and really getting in to cooking, I was working at home and raising my children. My time was more flexible and without a commute to work, I had a bit more of it. This made for an easier transition to a whole food cooking life. Now that I’m back in an office with lots of extracurricular interests, my time is limited, but there is still time for cooking and eating well, and that’s what I plan on sharing with you! For you who have gotten away from home cooked meals due to lack of time and you who are young and just learning how to fend for yourselves in the real world, I have tips and recipes to share to get you (back) in then kitchen and enjoying preparing your own healthy meals. No more chatter for today, let’s get to a recipe. One of my favorite stand-bys, Chicken Enchilada Bake. This is not a traditional enchilada recipe. In fact, technically it’s not enchiladas at all as there are no tortillas. It’s just a quick and easy 3 ingredient meal that can be made for one person or six with no extra effort. Grocery Store Tip: Purchase large bags of frozen chicken breast tenders (boneless, skinless, not breaded, just chicken). Trader Joe’s sells them in a zip lock bag. If you only need one or two or six, just throw the rest back in the freezer. They thaw quickly and can be cooked from frozen. In a baking dish large enough to fit the chicken in a single layer, place the chicken and cover with salsa. You want to be able to see the chicken through the salsa, so not entirely covered or you’ll end up with soup. Cover and bake until chicken is cooked. These don’t take long, maybe 20 minutes for 6-8 tenders if thawed. A bit longer if frozen. Remove cover and generously top with cheese. Bake until cheese is melted. Voila! Dinner is served. Add a side veggie or salad if you like. Spark it up by seasoning chicken with cumin before baking. Add extra chilies or chopped sweet peppers. You can customize this as you wish. So you’ve heard of chia seeds. Maybe you’ve even seen them on store shelves. They’re actually not all that new. It’s said that the Aztecs used chia seeds to survive long journeys. They even make really cool pets (yes, these seeds marketed as food are indeed the same little seeds that came in your Chia Pet kit). But what the heck can chia seeds do for you? For starters, they offer antioxidants (and who doesn’t need more antioxidants?) They also provide significant amounts of Omega-3’s (these are the Omegas we need more of). As mentioned in the title, they are a little weird. They are hard little seeds, but when added to liquid they get gelatinous. Kinda soft and squishy and slimy. You can add them to your yogurt or smoothies for an extra nutrient kick. This is probably one of the most popular uses. But when you add the proper amounts of the right ingredients, you can get a wonderful (healthy) dessert. Chia pudding is one of my favorite desserts these days. If you are ok with the texture of tapioca pudding, then you’ll probably enjoy chia pudding. While you can use almond milk and fruit, my preferred recipe includes coconut milk, dates, and raw cacao powder. The dates give a wonderful sweetness and the cacao powder offers a healthy dose of antioxidants as well as magnesium and iron along with a great chocolately flavor. Give it a go if you dare! Method: Soak dates in coconut milk for 20-30 minutes to soften. Stir in cacao powder until well blended. Add vanilla and chia seeds and stir well. Cover and let set in refrigerator for about 30 minutes for flavors to come together. Enjoy! Green drinks can take a little getting used to. They look and taste, well… green. Freshly mowed lawn and algae sometimes come to mind… but, put all that out of your mind. Green smoothies are chock full of nutrients, more in one glass that most people get in an entire day! 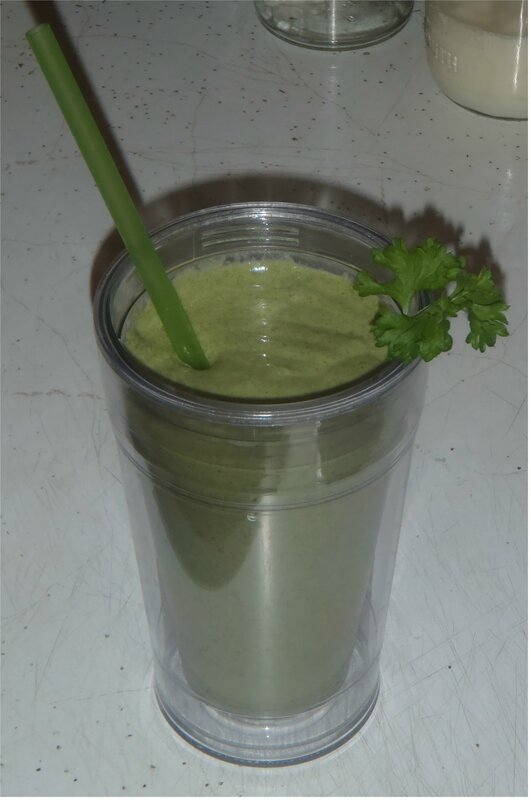 Ingredients: strawberries, pineapple, baby spinach, avocado, wheatgrass powder, fresh parsley, peeled cucumber, chia seeds, coconut water, raw milk kefir or carrot juice. Method: Add 1 Tblsp chia seeds to 1/4 cup coconut water and set aside to gel. I use frozen fruits and let them thaw in the blender cup overnight in the fridge so they are soft but still cold in the morning (about 3-4 strawberries and 3-4 chunks of pineapple). To the fruit, add a small handful of spinach leaves, 1/2 an avocado, 1 scoop of wheatgrass powder, a few sprigs of fresh parsley, and about 1/4-1/2 cup cubed cucumber. I then add about a teaspoon of either flax seeds or flax oil and 1/4 tsp of bee pollen. Add raw milk kefir or carrot juice (1/2 – 1 cup depending on consistency you want). Blend thoroughly. Just before drinking, stir in gelled chia seeds in coconut water. Of course, you can alter the fruits, veges, and optional ingredients. To make this vegan, use carrot juice instead of raw milk kefir and do not use bee pollen. You might be wondering about some of these ingredients. Parsley is a wonderful detox herb, aiding the kidneys in flushing toxins out. It is also very high in vitamins and minerals like vitamin C and calcium. Chia seeds provide protein, magnesium, dietary fiber and Omega-3’s. The gel also helps move toxins through (and out) of the intestines. Wheat grass powder is an easy way to help you reach your 5+ servings of vegetables each day. It is chock full of antioxidants and dietary fiber and also supports your immune system. So what are you waiting for, GO GREEN! Rolled oats, check… coconut flakes, check… salt, cinnamon, allspice, check… almond meal, mixed nuts, dried fruit, check… bananas, check… vanilla, check… canola oil … WHAT?! Canola oil? Really? You’ll demonize real unadulturated butter but praise a chemically altered GMO oil that turns toxic once heated? In the meantime, consider food. Real food, not a food-like product. Can you identify where it came from (it grew in the ground naturally, it is a part of an animal or came from an animal)? Would your grandparents recognize it is a food product (whether or not it came from their country or was part of their diet)? Could it be reproduced at home, from scratch (like making butter from unpasturized cream)? So many healthy and natural food products are declared unsafe, yet they are the foods that our country’s founders ate. Did the settlers have homoginization and pasturization processes? No, they didn’t need them. Unclean, profit-driven factory farms didn’t exist. Just the family cows, who may have even had names and were taken care of in clean barns and fields. Milk came straight from the cow. The cream that separated naturally was churned into butter, not hydrogenated spread. But butter and whole milk and animal fat cause heart disease, you might be thinking. Well, think again and do the research for yourself. Look up “lipid hypothesis” and then make your own decision (rather than relying on what the pharmaceutical companies are feeding to the medical industry). I could continue (and don’t you worry, I will in future posts!) but for now, suffice it to say that what the average American believes are healthy foods are not. But don’t just listen to me. I encourage you to do your own research (from a variety of sources, including sources not funded by big pharma, the processed food industry, and the FDA) and decide for yourself. So, another blog about food. There are many with healthy recipes (yup, this is one). There are many with quick and easy recipes (yup, this is one). There are many with fun, new ideas about eating (yup again, this is one). Seems like there are so many out there these days, what makes this one any different? Well, for starters, my definition of healthy eating is somewhat different than most others. I do not promote low-fat, low-cholesterol, diet, low-calorie, light, low-carb or any other food-like substances. I believe in whole food in its whole form (as much as possible). My theory on healthy eating is that if my grandparents recognized it as food, then it’s food. If it comes from a plant or ate plants, then it’s food. If it was made in a plant, I’ll pass thank you. I promote food that keeps you alive and healthy. Food for life. More about my theories and feelings about food and nutrition in future posts. For today, let’s take a look at comfort food. I’m home for a couple of days with a back injury and really not up to doing much of anything except trying to be as comfortable as possible. Is it possible for comfort food to be healthy? Absolutely! Comfort food is food that invites you to hunker down with a big bowl of something simple and delicious. No frills. No mess. While there are plenty of other healthy, comforting recipes, this one is a favorite of mine and I hope will become one of yours too. One key to keeping this recipe (and many others to come) quick and easy, is to always have a few key items on hand. One of my kitchen staples is a pot of cooked rice. A rice cooker is a beautiful thing and I almost always have a pot of rice in the fridge ready for stir-fry, fried rice, soups, or whatever. A few other staples: butter (REAL butter from a cow, not hydrogenated or soy based butter-like product that is nothing like butter), avocados (a true superfood that goes in everything from chocolate pudding to breakfast smoothies to nachos), lemons and limes (both versatile flavor enhancers as well as alkalizing and cleansing). Method: Scoop hot rice into a bowl. For the purpose of this recipe, let’s say 1 – 2 cups. Add about a tablespoon of butter (yes, a whole Tablespoon, maybe two if you’re using 2 cups of rice) and stir so butter melts into rice. 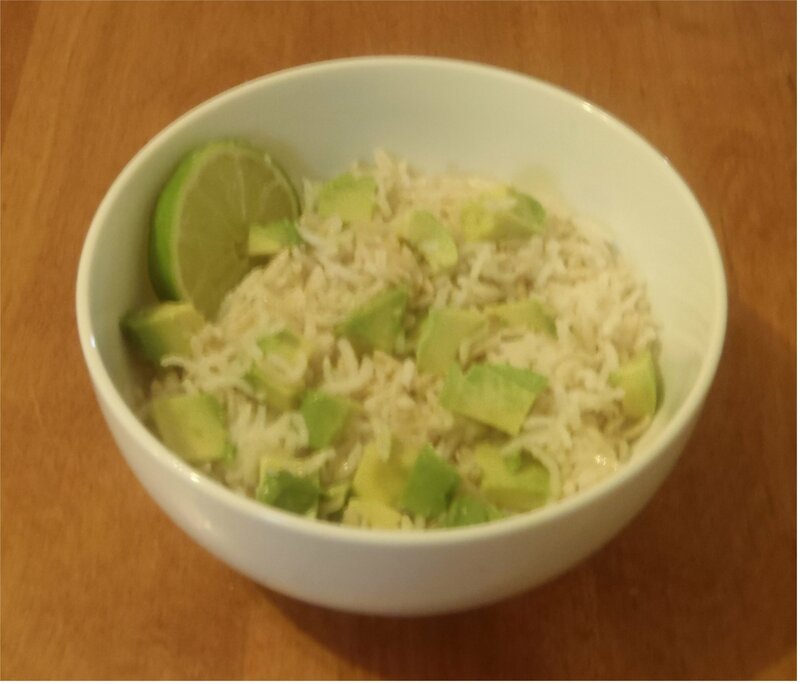 Cube the avocado and add to the rice. Add a squeeze of lime juice and salt and pepper to taste. Toss gently with a fork and enjoy. So simple and so satisfying. Serve warm on a cold day or let cool to room temperature on a warm day. Either way, it’s nourishing and comforting. Welcome to LifeWalk Recipes, where you'll find nutritious recipes to keep your walk in this life a healthy one. I don't subscribe to most conventional health dogma. You won't find low-fat, low salt, light or diet recipes here. Just real recipes for real people using real food.